Filming For Marathon Bombing Movie Stirs Emotions In Boston Patriots Day begins filming in Boston on Tuesday. The movie has already stirred emotions, as some don't want the deadly drama playing out again in their backyards. 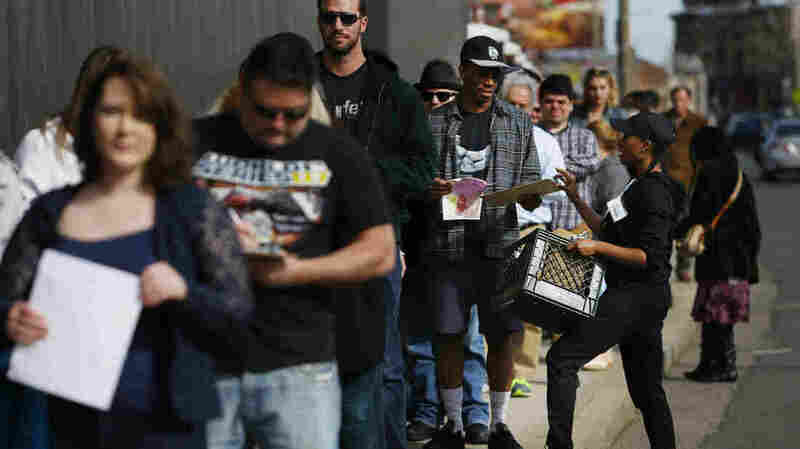 People wait in line in Allston, Mass., on March 13 for an open casting call for Patriots Day, a feature film about the Boston Marathon bombing. "I think I've never seen a line this long ever," says Grace Gallant of Boston Casting. She's literally out of breath from collecting buckets of resumes and headshots from thousands of movie star wannabes who started lining up at 4:30 a.m. The line is a motley crew of Joe Six-Packs in Red Sox T-shirts, buff marathon runners in official bibs and brawny officers and firefighters in uniform. The film, Patriots Day, stars Boston native Mark Wahlberg and begins filming in Boston on Tuesday. It's already stirred emotions and a bit of controversy, as some don't want the deadly drama playing out again in their backyards. John Herring was working for the state police in Watertown, Mass., the day Dzhokhar Tsarnaev was caught. He says he's concerned the movie will dwell on the bombers rather than those who risked their lives to capture them. "I want to make sure they can do it right," he says, "and it shows our strength, our courage, resilience." These are the people that we're making the film for, and the pressure we feel to honor these people is what fuels us. Director Peter Berg says that's exactly his intent. "These are the people that we're making the film for, and the pressure we feel to honor these people is what fuels us," he says. But, he adds, it's also important to convey the evil of the attack. "We have the ability to reach 50 million people and remind them of the horrors of this tragedy, and encourage people to look at what type of demented minds cause such crimes so that they can at least be alert to that," he says. Among those with a keen interest in the movie is Jeff Pugliese, whose police officer father got in a firefight with Dzhokhar and his brother, Tamerlan Tsarnaev. Pugliese expects the film to take some artistic liberties. "You know, it's Hollywood," he says. "They're going to have to make it fun to watch. You know, it's a movie. It's not a documentary." "He was put in extraordinary circumstances and he behaved extraordinarily," Pugliese says of his father. "And as a result, nobody died during the firefight except for some scumbag who deserved it." Pugliese really wants a part in the film, though he says it would be hard to be in some scenes, like the shootout. "It gives me like butterflies and goosebumps and everything," he says. "Kind of makes me uneasy, but it's everything together that makes us who we are now, so I don't want to forget anything about that." For others, however, the movie is too much too soon. Watertown resident Maria Van Ryn was woken by the 2013 firefight near her house and still jumps when she hears sirens. "That is gonna be tough," she says, "kind of, in a way, reliving it all." So when the moviemakers wanted to film the shootout in the same spot with simulated explosions and gunshots at midnight, Van Ryn was one of several in the neighborhood who balked. "For me it was just: There's no way they can do this," she says. "Because I'm thinking to myself: That's going to stir things up all over again." 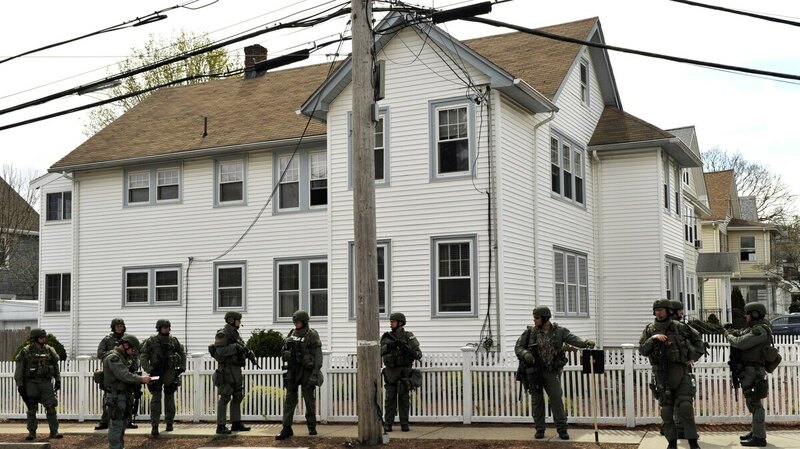 Law enforcement searches houses in Watertown days after the Boston Marathon bombing. Watertown resident Maria Van Ryn balked at the idea of Patriots Day re-creating the 2013 shootout in her neighborhood. Ultimately the moviemakers relented and will film the shootout on a set. Berg says a few survivors and victims' families have asked not to be portrayed in the movie, but most support the film, even if it may sting. Survivor Lynn Julian says, "For me, it's going to trigger a lot of PTSD." But, she is quick to add, even a movie about the terrorist attack that could've killed her can be a net positive. "We don't ever want people to forget that we were Boston strong and that we took care of each other. How it's not how you fall down, it's how you get back up," she says. Before Patriots Day comes out in theaters, survivors and first responders will get a private screening. Berg says when the lights come up and he looks them in the eye, he'll know immediately if he got it right.